Merlo’s Limousines and Charters provides professional, chauffeured, ground transportation at contract rates to corporations and businesses in the Greater Houston area. Our extensive fleet of minibuses, shuttles, limo buses, motor coaches, SUVs, limousines, and town cars makes us a smart choice for any corporate need. Merlo’s maintains all of the necessary credentials to service Houston’s airports. When you make a reservation with Merlo’s, our trained staff will always ask for the flight information. This assures that flight delays will be handled appropriately and ensure you have the most convenient transportation possible. No matter how large a group, Merlo’s can handle the transportation. Take the stress out of your social events and assure that everyone gets home safely with Merlo’s event transportation. Rest assured that your VIP is handled with the utmost class and professionalism. Experience is key. Merlo’s has chauffeured dignitaries from all over the world, celebrities, and titans of industry. You know your VIP will be handled professionally when you chose Merlo’s. Merlo’s can handle the large projects that other companies can’t. No group is too large. 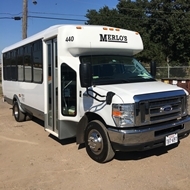 Whether you need in town shuttling or need to charter a motorcoach to go out-of-state Merlo’s has you covered.